Our commitment is to our clients. We offer personal attention and “Independent” advice. Our goal is to establish trusted, life-long relationships from generation to generation. We have the energy, wisdom and time to navigate the complex world of insurance. 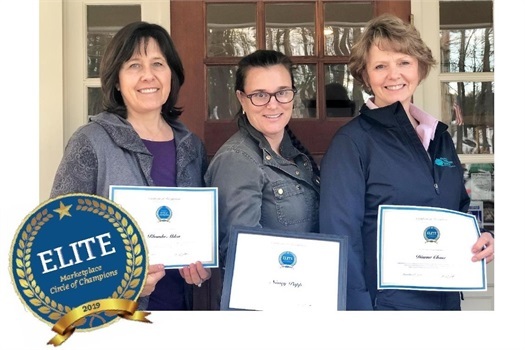 Following a very busy Open Enrollment season, Rhonda Alden, Nancy Papp, and Dianne Chase licensed agents with Doran Independent Insurance, showcase their certificates of accomplishment for the volume of individual enrollments processed through the Healthcare Marketplace. The Circle of Champions is a select group who enroll 20 or more individual applications, with further recognition of Elite Champions for 100 or more enrollments processed between Nov 1 – Dec 15. Are you under age 65 or over? Either way, we can help you navigate through the complex world of the Affordable Care Act and Medicare. Let us show you how long-term care can not only help you in the future but your family as well. Need a life policy for your family or for your student loans? We strive to keep all generations knowledgeable about how beneficial life insurance really is. Although health, long-term care and life insurance may be our focus we also specialize in many other ancillary products. Licensed for insurance (Health and Life) in New Hampshire, Maine, Massachusetts.